Spurs lack the needed firepower against an electric James Harden. The month of January was not kind for our Spurs. Losing their franchise player for the foreseeable future while going a painfully mediocre 9-7 made the first 30 days of 2018 a tough transition into the new year for the perennial contenders. 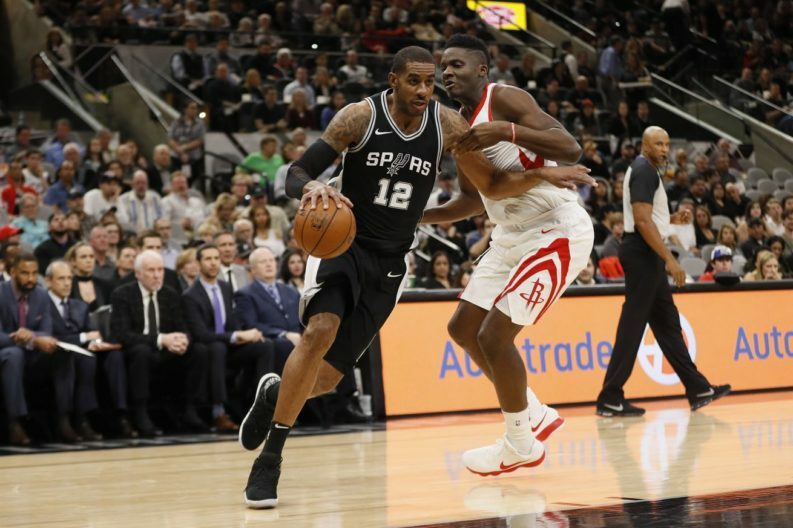 Unfortunately for the Silver and Black, flipping the calendar page into February did not seem to solve those issues, as the Spurs took on a scorching hot Houston Rockets ball club. Yet again, San Antonio struggled to create offensively and failed to consistently move the ball, as they put forth a porous 38 point first half performance, which didn’t bode well against a prolific and explosive team like Houston. The ball movement picked up a bit in the second half, and the defensive pressure tightened, but the Spurs were simply outclassed against a Rockets team that might be playing their best stretch of the Harden era. Here are the takeaways from an aggravating night of basketball. Danny Green was eager to get to the rim tonight, as the Rockets continuously ran him off the arc. In years past, this would have led to a cringeworthy night for the veteran sharpshooter. Now, the former Tarheel has evolved his game and become a deadly weapon to teams with a one dimensional game plan. He’ll never be a guy who you isolate and tell to go get a bucket. However, his growth offensively will significantly help a stagnant Spurs offense come playoff time. LaMarcus Aldridge struggled early from the field and seemed really bothered by Houston’s length, the continuous double teams, and the defensive pressure from Clint Capela throughout the night. The severe lack of spacing also gave the all star big man little to no room to operate, as the good guys went cold from beyond the arc. This team is sorely lacking a perimeter playmaker to balance out the offense and ease the scoring burden that has been placed on Aldridge’s shoulders. The fact LA has put up the type of numbers he has this season with this supporting cast is truly astonishing. Pau Gasol was incredibly disappointing against a Houston team he should’ve punished on the low block. The Spurs ball movement in the first half didn’t do the big man any favors. He looked lost and outmatched anytime the Rockets sent a double team his way. Defensively we knew going in that the veteran Spaniard would struggle in this matchup, but he lacked aggression on offense at a time when the Spurs needed all of the firepower they could get. Manu Ginobili struggled against an athletic Houston backcourt. The sixth man had a tough time turning the corner on pick and rolls and seemed to press when the Rockets hedged on his screens. I wouldn’t put too much stock in the forgetful performance though, as there weren’t many bright spots offensively for the home team, and he proved to be more than capable against this ball club last April. Dejounte Murray is going to be a special player for the Spurs one day, but goodness does the second year guard test my patience during games. It seems like a roller coaster ride every time he takes the floor. There are times he’ll leave you in awe after a baseline floater or athletic rebound, and then he’ll foul a jump shooter or sail a ball three feet over a player’s head the following possession. In a season that the Spurs suddenly find themselves fighting to stay in the top end of the playoff standings, it is tough to accept him being thrown into the fire of what are becoming increasingly important games after each loss. Despite a plethora of open looks, the trio of Tony Parker, Patty Mills, and Kyle Anderson just couldn’t get a shot to drop. The lid on the basket for these three significantly hindered the Spurs comeback effort in the second half, and the Rockets were quick to take advantage of their misfortune and put the game away.